Just about anything you can imagine or want can be designed and built with hardscaping. Let your imagination run wild! Maybe you want a romantic lounging area built nearby your swimming pool. Maybe you’d like a pretty stone pathway leading into the garden. Or perhaps you’d love a brick retaining wall built as an estate entrance. 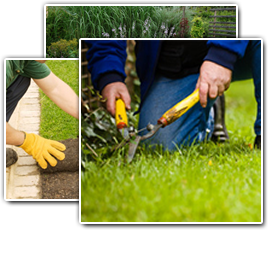 There are many things an experienced landscaping company can do to enhance your property with hardscaping. SS Grading is a premier leader in the Richmond landscaping and excavation industry. We are hardscaping specialists so we’ve put together a few ideas for you. If you have any questions or want more great hardscaping ideas for your Richmond home, just give us a call! With an outdoor fireplace, you can have room for family and friends to gather. Why not add a two-way fireplace that you can enjoy from your sun room and outside patio area? With two-way fireplaces, you can shut off either room with a fireplace glass insert that opens and closes at will. Many homes have this type of fireplace in their homes. Whether it’s a two-way fireplace or just one for your patio, why not have one built so you can enjoy cool evenings? If you love hanging around outside, you’ll love getting a new outdoor kitchen space. Whether you just want a place where you can barbecue or you want a complete setup with gas stove, oven, pizza oven, sink, and covered eating area, an outdoor kitchen will serve many functions for you. If you like to garden, having a sink outside to wash your veggies and a counter to prep them on will greatly enhance your outdoor living style. Your outdoor kitchen can double duty as a fish cleaning station too. Retaining walls are built for many reasons, so it’s a great idea for them to serve more than one purpose. For instance, you can have any type of retaining wall built for your backyard which can also serve as extra seating space for guests. If you love to entertain, your friends and family can sit along the wall during crowded parties. Retaining walls help resolve rainwater runoff problems and are also great to build around the edges of a pool surround. Imagine having a pool party with guests enjoying drinks and hors d’oeuvres around the pool. They don’t have to fight for places to sit when there’s a long retaining wall to serve that purpose. We suggest topping the retaining wall with beautiful terrazzo or Saltillo tile for a comfortable, smooth surface. Terrazo brings a modern flair to the outdoor living space while Saltillo is a classic, old-world favorite. Retaining walls can also be used as planters. Want to grow your own herbs? Why not have one built to contain your herb garden? The height of the growing bed can be raised with poured concrete at the bottom of the bed to make gardening easier and help keep weeds and grass from growing into the area. The retaining wall itself will be a convenient place to sit while maintaining the herb garden. If you have some beautiful trees out back, you can have retaining walls built as tree surrounds. This helps keep moisture where it belongs for healthier trees and adds a touch of class to your landscape. Pavers are a wonderful product for building hardscapes. They come in many styles and colors and can be custom set to create unique styles. Plus, they go great with just about any other kind of hardscaping material including brick, stone, and concrete.